I am so sorry to let you know that dear Sampson lost his battle with geriatric renal disease. Sampson had rebounded and had a great fall season. He spent his time out in the sun, curled up with his friends or taking walks under the trees. When fall arrived, he huddled under a heat lamp in the den or inside the building on his fire hose hammock with his friends. I know the pain I feel today mirrors the love I had for Sampson. Even though I thought I’d prepared myself for this moment, it was more difficult than I can express. As he slowed down, the treatments would need to become increased. As devastating as it was to think of a day at the Sanctuary without him, I always promised him I would not keep him here for me. It was his life, and he deserved a great one. So, today was the day I had to honor that promise. 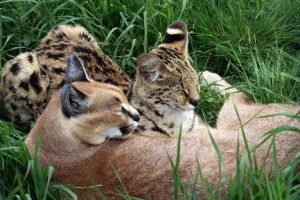 As one of the founding cats of The Wildcat Sanctuary, Sampson was lucky and spent 17 years only knowing love and compassion. Sampson touched the lives of so many. I think it was because his personality was so distinctly different from that of a typical caracal, and his floppy ears mirrored that. 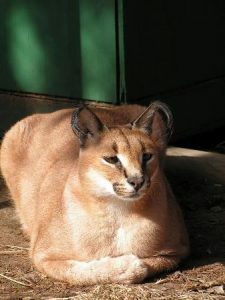 Caracals in general may imprint on an individual caretaker, but often have a hissy demeanor. Not Sampson. Sampson would bull doze his way into the hearts of his habitat mates and visiting humans. He wanted to be friends with everyone and he wouldn’t take no for an answer. The only cat he never completely won over was new arrival Aurora, and I believe that’s only hindered by the time he had left. During the last month, Aurora was in a den in the habitat and Sampson decided to join her. She hissed, smacked and protested about sharing the space, but Sampson being Sampson, he went in anyway and curled up beside her. She was surprised and just sat behind him. Sampson went to sleep in the way only Sampson could. Since his recent passing, we’ve also honored Aurora’s wish this winter and moved her to her own habitat complete with a cozy indoor area. She seems to really like the new area, especially having the building all to herself. We’re always flexible in accommodating what will help each cat thrive here at the sanctuary and she’s made it clear this is what she’d prefer for now. Celebrating Sampson, you cannot help but smile. Most of his life, he was a little chubby for a caracal and his tufts were floppy. He was very animated and would call and chirp in response to a caregiver saying hello, a serval talking and even Nigel talking when he was here. He was very excited to have a conversation with a cat that sounded just like him. In the sea of servals he lived with, he definitely stood out. He liked to initiate “the huddle” and curl up with all of his habitat mates. But, Cleo the serval always had to be the closest. She was his girl. She was the first resident of TWS, and when they met at a young age, Sampson was smitten with her. And for years, he just assumed he was a serval, too. To Sampson, Cleo was special and the most beautiful serval in the world. They were bonded, but luckily over the years, they expanded their circle of friends to include Rocky and Mufasa. Cleo has been seen with them since Sampson’s passing. Sampson never had a grumpy day. The only conflict that ever arose was a small hiss and smack at feeding time to let Bosco and Rocky know, Sampson wanted his meal. How else would he maintain the rotund figure he was known for, for so many years? Later in life, Sampson slimmed down. It was good for him since he also had degenerative joint disease in his hips. But, he never lost his signature ear flops, or the twitch of the head before he let out a huge hello. On windy days, he would walk and his ear tufts would stand straight up like other caracals. He seemed to enjoy that very much. His last day, he made just as special and filled with love. He talked, when spoken to, and passed peacefully. He made it as easy on us as he possibly could, because that was just how Sampson was. He never lived his life solo, it was always about those around him. And that is how he will be remembered. Sampson, I promise you, I will stop the tears soon and remember you with a smile. Because bringing others joy was your life mission, and I know that’s what you would’ve wanted. Cleo and you will be reunited one day. Until then, she continues to have “the huddle” and love here at the Sanctuary. I will miss you my dear friend. Sampson was the second cat to come to The Wildcat Sanctuary and, therefore, holds a special place in our hearts. He is a very sweet little caracal. Though we’ve tried to introduce Sampson to other cats of his species in the past, he seems to prefer living with his little spotted friends. Sampson lives with a group of servals, which are, like caracals, another species of African wildcats. We think he just likes being the ‘different’ one in the group. 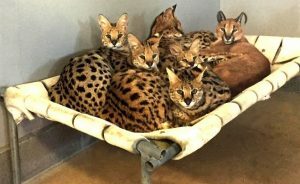 Sampson’s serval friends have accepted this ‘outsider’ and love him for who he is. They’re very accepting of the differences between them. You’ll find them all curled up together napping in the tall grass during the summer or lounging on their inside hammocks during cold winter days. Animals can teach us so much about tolerance and acceptance, can’t they?